Craig Eastmond of Sutton United scores their winning goal. 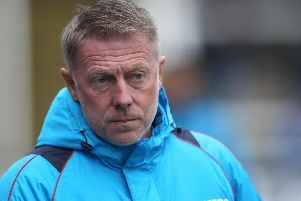 Hartlepool United suffered just their second home defeat of the season after losing 3-2 to Sutton at the Super 6 Stadium - but did anyone stand out? After falling behind to Aswad Thomas’ 22nd-minute opener, Pools took the lead courtesy of goals from Niko Muir and Liam Noble early in the second half. But Matthew Bates’ side couldn’t hold onto their advantage, as Tom Bolarinwa popped up with a second-half equaliser, before Craig Eastmond netted the winner. As the result suggests, Pools weren’t at their best - but did anyone come away with any credit? Our man Liam Kennedy has delivered his verdict and dished out his player ratings. Click the link above and flick through our gallery to see how each Pools player performed.